As you might have heard, a love for old Pontiacs is something that sort of runs in my blood. I can't even begin to count the number of classic Ponchos my dad owned when I was a kid. However, unlike a lot of brand devotees out there, I'm far for a purist when it comes to these, or any other type of car. 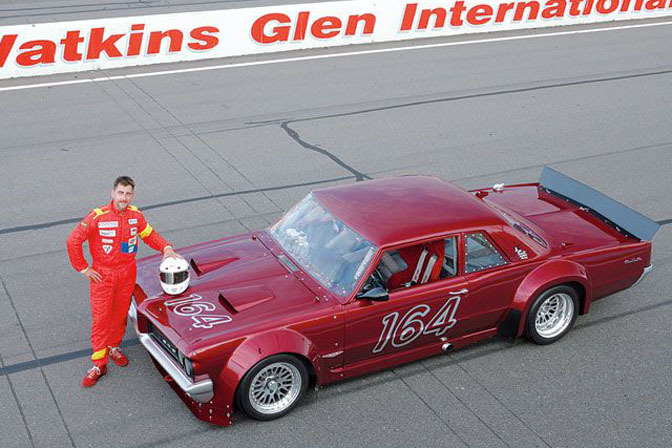 That may be the reason why I think this '64 GTO road racer is one of the coolest cars ever. The 1964 GTO is a historic automobile, and most credit with being the first real muscle car ever. But, when have you see one like this? While the split grills and twin hood scoops immediately identify Don Stellhorn's car as '64 Goat, there isn't a whole lot of 1960's Pontiac left in it. 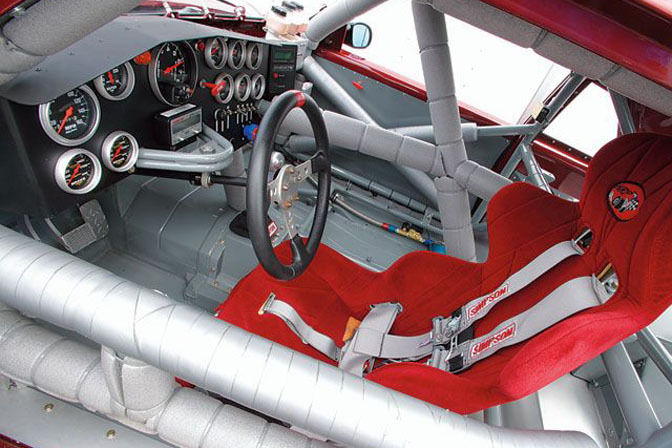 Originally starting a teenage project in the '80s, the car eventually became a weekend warrior that saw action at road courses on the East Coast. 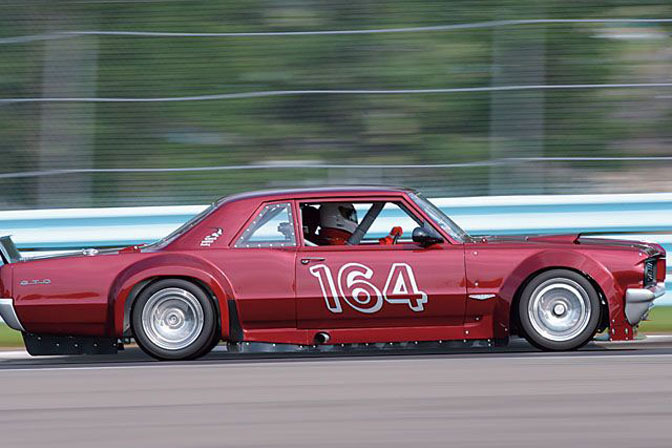 After a crash at Summit Point nearly destroyed the car, Don decided to resurrect the GTO as the no-holds-barred race car you see here. While first generation GTO's are extremely popular among collectors and restorers, there aren't too many corner-carving GTO owners out there. That means that Don would be moving into unknown territory with his project. After studying up on the art of race car design, Don would heavily modify the original GTO chassis with the help of a CAD-program. The entire frame would be strengthened all over, with all the suspension points being relocated. I'm not a purist, but even I get a little disappointed when someone puts a Chevy motor in a Pontiac, or any other non-Chevy GM car from this era. 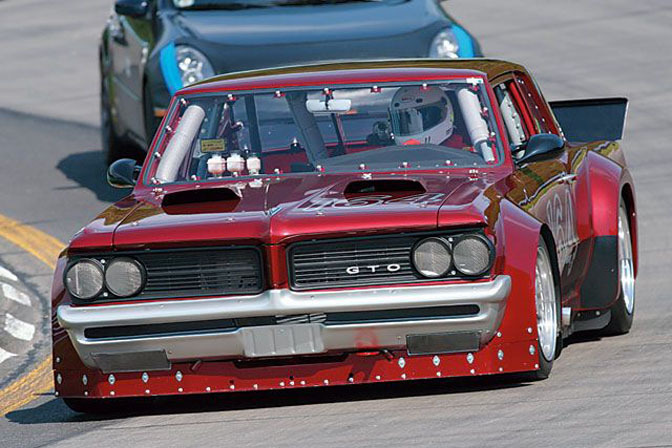 Luckily though, Don's GTO gets its thrust from a traditional Pontiac V8. 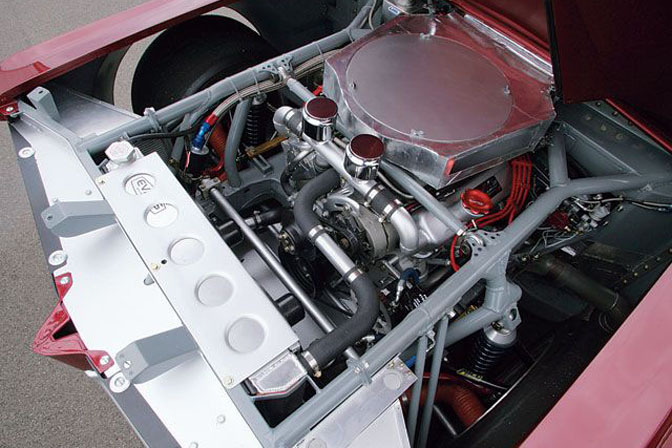 Originally starting as a 455 from 1970, the engine was destroked to 440 cubic inches and outputs a solid 440 horsepower. The view inside the trunk shows just some of the work Don has done to the chassis. Incredible. 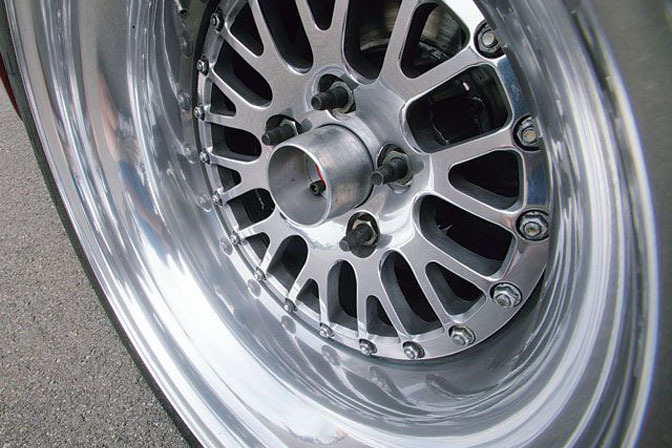 The GTO's custom race wheels measure 17×12.5 on each corner, and sticky 335/35/17 rubber helps put all that power to the ground. All the work on the car is put to good use at East Coast open track events, where the GTO puts smiles on the faces of all who see it, and scares the crap out of Porsche owners. As wild as the car looks in these photos, I'm sure it's even crazier to see and hear this thing in person. 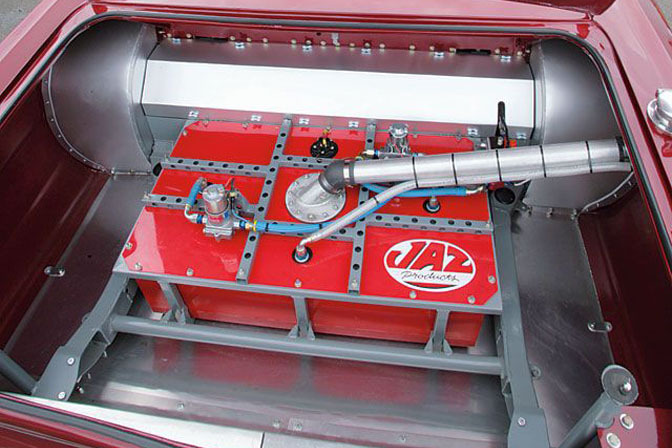 For full specs, and a detailed history of the car, check out the Hot Rod Magazine feature on it. Beyond awesome. Wish he brought it to West Coast events. Beautiful car....really stunning...but I think the owner used too many rivets, bolts, and Dzus fasteners on the body panels. One of the coolest track cars I have seen you guys feature yet. 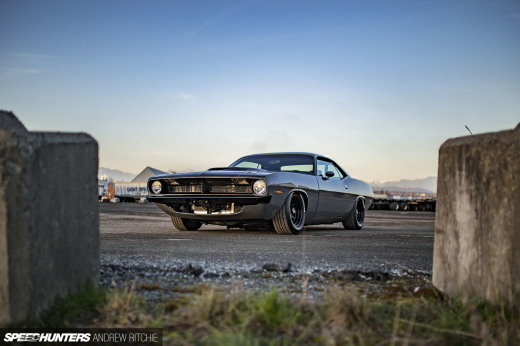 SH needs to do a shoot and article on the Goodguys camaro. That thing is damned ridiculous. I love road racing muscle cars. Bob Owens camaro is another great one, and no stranger to Laguna Seca. I love how long that boot looks. Oh, and you have any cool front/side picture of this for a wallpaper? That is one sick car! Not to offend anyone or anything, but looking at this car makes me think that it resembles the Hakosuka, somewhat.... isn't it? I want one just like it, NOW! :D Genius design and craftsmanship! Wow this is surprisingly awesome. Too bad the fender arches are a little jenky but the rest of the car is amazing. Very nice find Mike. I'd be the first one asking for a ride-along if it were possible. Honestly, the only GTO I like. lol. Thats deffinitly the coolest GTO ive ever seen! wicked! i'm going to go hunt for videos of this thing! Without a doubt - this is for me the best looking car EVER featured on Speedhunters!! My god Mike, I am deeply in love with you for featuring this car. I thought nobody else knew about it! 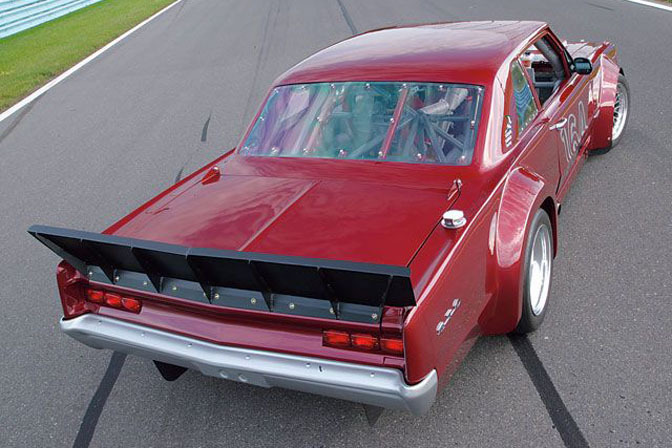 Might there be a feature on the '64 Ranchero road racer? Nice example of thinking, exploring, before making anything on a car. Car is great and sensible too, with no ''nonsense 100000000'' bhp. I bet the car will live long thank to it's owner and the fact it's not built for numbers. Love it. Looks a little Bosozoku, anyone agree? Check it out on the track...sounds mean!!! also check out the other group c car it passing ,there is a RX& in there at start -Truly BADASS !! Don is a great friend of mine as well as work employee, his heart and soul is poured into his 64' GTO which shows on every inch of his beloved ride. IT IS AND SOUNDS AS BAD AXX AS IT LOOKS !!! AWSOME, absolutely awsome. More more more cars like this one please.